Boasts one of the most one-note protagonist in animated film history, some troubling racial elements, and a paint-by-numbers execution that makes this film about the dream to go fast feel painfully slow. It seems "slow and steady wins the race" doesn't carry much weight in an era of instant gratification. The prevailing sense with Turbo is that it's overly calculated while receiving none of the basic care and attention it requires in order to thrive. 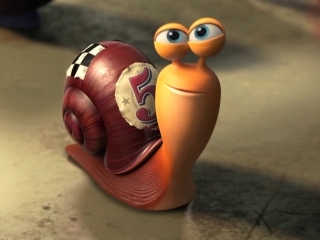 Destined to be remembered only as That Snail Movie. The film looks great (which is barely even worth mentioning in reviews of CGI movies anymore), but it has problems under the hood. A family-friendly talking animal underdog sports film that basically condones the use of performance-enhancing drugs. Somewhere, Rudy Ruettiger is crying. David Soren and his Dreamworks Animatoids follow the Pixar playbook page by well-thumbed page, replicating the utilitarian plotting and kooky characters that lend themselves so completely to merchandise spin-offs. While mostly harmless, a sluggish Turbo sputters its way to the finish line. While 'Turbo' isn't a chore for an adult, it comes close enough to make the differences between Dreamworks and Pixar more apparent than ever. This flashy fantasia attempts to fuel-inject an American dream that is stuck in a recessionary slow lane. Let's face it: Kids aren't a very demanding audience. If there's color, movement, and a high quotient of silliness, they're happy. Content to be merely cheerfully clichéd, it's an assembly-line kids' film that, unlike its daring protagonist, risks little, and thus reaps only modest rewards. The story is inspirational, but the movie isn't. Small kids will probably get a kick out of it, but parents will most likely be bored. I know I was. Even my 9 year old didn't care for it. An attractively designed but narratively challenged, one-note film. One of those dull films where parents are gonna have to take one for the team and suffer through. It is aggressive, poisonous in its mediocrity, not just denuded of imagination and creativity but openly contemptuous of the idea of such things. Visually colourful but narratively bland ... Turbo zips through your brain without leaving a mark. Wimbledon doesn't expressly prohibit rhinos either, but something tells me the eligibility of a magic, tennis-playing rhino wouldn't be a quick decision. Showcases a bit of wily imagination but quickly ducks back into its shell, opting for a safe, all-too-familiar athletic story of underdog triumph.